Italy watches more TV than any other country in Western Europe: more than four hours per-person per-day in 2015, according to IHS Markit. Its study on TV viewing times across the UK, France, Germany, Italy and Spain, also shows that non-linear pickup has been swift in the UK but a slow starter throughout the rest of Western Europe. The majority of viewing time is still tied to the broadcast schedule be it live or through catch-up; online revenues in 2015 were just 3% of total television revenues in the UK, France, Germany, Italy and Spain combined. Italy – Keeps top spot with four hours and 40 minutes per-person per day of TV viewing. Italy watched the most minutes of TV in Western Europe with 280 in 2015, according to the latest IHS Technology study on viewing times. In 2015, non-linear viewing rose to 18 minutes per day while combined linear and non-linear broadcast content viewing stood at 271 minutes and 41 seconds per-person per-day. “Linear viewing remains king in Italy,” said Daniel Sutton, senior analyst at IHS Technology. “Similar to Germany, pay-TV on Demand is not gaining traction in the Italian market. Online long-form reached 46 seconds per-person per-day in 2015. As with Pay-TV Video on Demand, the dominance of transaction-based services can be pointed to as an inhibitor for growth in this area. Despite the big number and the second place slot, the amount of time spent watching TV in Spain is actually declining, according to the latest IHS Technology report. Linear television viewing once again dropped sharply in comparison to prior years, falling to its lowest level since 2010 at 234 minutes per-person per-day. 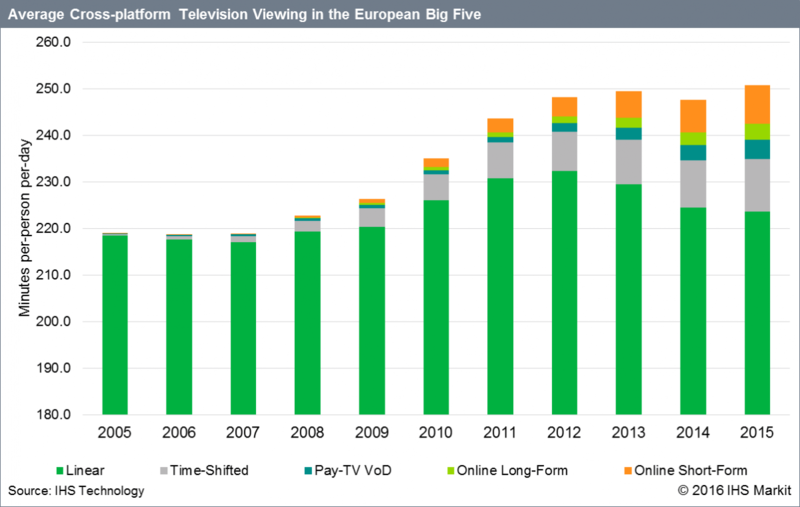 Notably, non-linear viewing time has seen growth in Spain. “We saw an increase of 22% on 2014’s non-linear viewing time figures to 16 minutes and 26 seconds per-person per-day in 2016,” Sutton said. The largest portion of growth in non-linear viewing time in 2015 was from online short-form content, of which viewing increased by 20.8%t on 2014 to eight minutes and 49 seconds per-person per-day. France takes third place in terms of TV viewing time in Western Europe. TV viewing time in France rose by three minutes in 2015, to a total of 224 minutes per-person per-day. The increase was driven by viewing times in two groups, the under-14s and over-50 age groups. “We have also seen a large rise in non-linear viewing times in France over the past year, with television on-demand services from IPTV operators and short form video from the likes of Daily Motion leading the way,” Sutton said. Non-linear viewing time outpaced linear, increasing by 17.9% over 2015 to 23 minutes and 54 seconds per-person per-day. At 2015, this represented 9.6% of total viewing time. Total cross-platform viewing time returned to growth in 2015, with the average British person watching 247 minutes of video content per-day across all platforms. In the UK, linear television remained the most popular mode of viewing in 2015, at 187 minutes and 42 seconds per-person per-day. However, the fall was less dramatic than in 2013 and 2014. Broadcast’s share of total viewing has been in steady decline since 2005, having decreased from 99.8% in 2005. Despite this, over the same period UK television market revenues have displayed an upward trend. Total TV revenues at the end of 2015 stood at £13.9 billion, up from £10.3 billion in 2005. Online long-form viewing time increased by 25.7% to nine minutes and 24 seconds per-person per-day in 2015. This was against the backdrop of a growing online video sector. In 2014, subscription video on demand (SVoD) subscriptions and online video transactions grew by 30 percent and 12.7%, respectively. Total online revenues (inclusive of online movies, online TV and SVoD) increased 26.3 percent against 2014, driven by SVoD. Germany watches 210 minutes of traditional TV per-person per-day. Notably, total TV market revenue increased 2.6% in 2015 to €16.8 billion, largely due to a €311.5 million increase in pay TV revenue. “Online services such as Amazon Prime and Maxdome are growing in popularity in Germany, but are somewhat struggling to gain traction,” Sutton said. Online long-form viewing in Germany increased by 30 seconds per-person per-day to reach two minutes in 2015.